Moving on is a struggle: Chris McCormack reviews Lucy Caldwell’s relocation of Chekhov to Belfast. Three Sisters at the Lyric Theatre, Belfast. That seems an open question for audiences in 2016, some who might prefer confining those decades of violence to the past. But Caldwell, no less than Chekhov, recognises that moving on is a struggle. This brilliantly bold Lyric Theatre production, vigorously directed by Selina Cartmell, makes Chekhov’s play immediately strange. In a new prologue, for instance, the stepsister of the tale once drawn as a bullying landlord is now an Asian immigrant (Shin-Fei Chen), looking back from the present with warmth (“These are my sisters”) but also curiously elegiac (“For years now I have dreamed almost entirely in English”). Also unrecognisable are Chekhov’s sisters, who first appear to us amidst a jumble of fancy dress costumes celebrating the birthday of their youngest, Erin (Amy Blair). 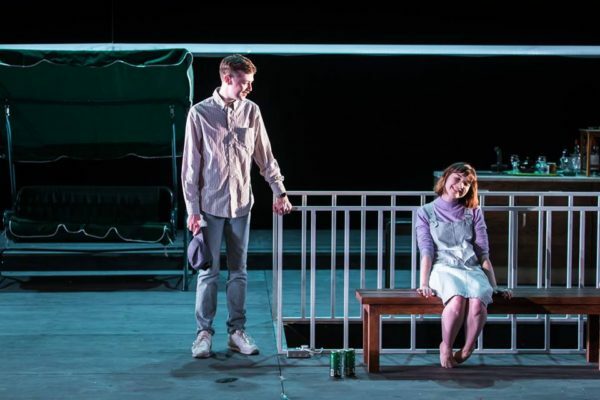 Perhaps Alex Lowde’s stage design, including its non-specific gauzy house set, makes the play difficult to access because these women – the orphans of an English Catholic father and an Ulster Protestant mother – are impossible for their place and time; even we can’t reach them. No wonder they want to sell their house and move to America. The flashy touches won’t win over everyone, though Cartmell seems fascinated by how they can make the second half of her staging feel rivetingly spare. With enormous clarity, we look on as the sisters’ escape grows complicated due to relationships struck up with English soldiers placed during the Troubles. Depressed Marianne (a self-possessed Christine Clare) is long disenchanted with her disc jockey husband (a very disarming Patrick McBrearty) and becomes drawn to Tim Treloar’s optimistic officer, Vershinin. Similarly, Blair’s Erin, a poignant picture of youth dispossessed, weighs up whether to forego a future romance or accept a proposal from the kind lieutenant (amiable Lewis MacKinnon). Her eldest sister Orla is busily maternal but Julie Maxwell nicely suspects her loneliness (“- if I had the chance – I would”). Meanwhile, pastimes of drinking and gambling come into relief as side effects of local violence. Niall Cusack fools us all with his portrayal of a drunken family friend, but, tragically, unravels to share a heart-breaking loss that changed him forever. That’s how Caldwell has made Chekhov’s play astonishingly resonant, making it alive to past trauma brutally embedded in the present. Even those at a distance to the conflict such as the three sisters stand to be utterly transformed, as a pacing peace process puts their soldiers’ futures in doubt. Three Sisters is on until 12th November 2016 at the Lyric Theatre, Belfast. Click here for more details.